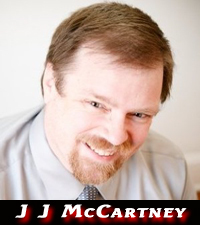 JJ McCartney is a lifelong broadcaster, since the age of 15. JJ was born in Anchorage, Alaska, and whisked away for a few years to get educated in his parent’s home-state of Arkansas. JJ graduated college at age 18 and has worked in broadcasting every step of the way. Today, JJ hosts The JJ McCartney Show, which is produced by his very own Nightside Radio Studios in the anonymity of rural western Nebraska. A lifelong conservative Christian, JJ is devoted to walking in obedience to God, and to sharing the good news, the Gospel of Jesus Christ, and the truth about what has gone so terribly wrong with America the last 100 years. JJ lives with his wife of 26 years, 2 dogs, and occasionally a visit from their college-aged daughter.